This beautiful studio apartment is located in the Beaches area, across 2km long beach with a boardwalk and a bike trail. It is very close to Downtown - only a quick streetcar away. Here you will find everything from great restaurants to cafes and grocery stores as well as pubs and ice cream stores. A true walking community! The apartment is across the beach - you can see the lake from the balcony. It's also across a free outdoor pool. The street car and the bus are couple of steps away. Beaches is a very safe community. There is no Hotels in this area. Jazz Festival, Parks, Beaches, hiking/biking trails make this part of the city very special and desirable. The apartment is full of sunshine. It comes with full kitchen and all cooking necessities. You will enjoy having your breakfast outdoors, on the balcony. Car can be parked in the detached garage. There is a cosy backyard, as well as the front room which are shared areas and which are you are also welcome to use. The atmosphere at our house is very tranquil and quiet - mostly suitable for adults or children above 7 y.old. No excessive noise allowed at any time. Private bathroom is located on the floor below, down one flight of stairs, through the foyer. Queen pull out couch is used as a fame only and topped with deluxe medium soft mattress . Fresh towels, toilet paper, soap are provided. Free WiFi. Landry is $20 per 3-5 day stay. Garage parking for a small/medium size car is $20 a day. Cleaning fee is $100 per stay. The bathroom is located one flight of stairs down from the living room. It has a shower. Toilet paper and bath towels are provided. One change for a less then a week stay. One spot in detached garage is available. Only small and medium size vehicles can fit. Please, discuss this issue if you have an SUV or VAN. The charge is $20 per car per day. Only bath towels are provided. Please, bring your own beach towels. Living room is a shared area but open for use. All pantry items like salt, pepper, spices are welcome to be used. There is table for two on the balcony as well. This location with the beaches only a block one way and the trolly, shops and restaurants just a block the other way made for an easy visit to Toronto. The Hostess was welcoming and helpful upon our arrival. We loved parking the car in her garage and using the local trolly during our stay. The Studio apartment was well appointed and clean, although a bit tight, but having the balcony helped expand the space. Do note, however, that the clean and dedicated bathroom is located a level below the apartment. Awesome!! It’s a perfect place to come enjoy, relax and discover Toronto! Property is beautiful, location is great and owners were Terrific! We would highly recommend staying to Everyone! Wish you a nice day .. Below are some points I would like to clarify before making any further arrangement. 1: Eugenia said the washroom are dirty and wet. We went to check together and everywhere is dry. Even after I bath I left the washroom with the floor dry. All rubbish is placed neatly inside the plastic bag. I was just felt so so unfair by being blamed as making the house dirty and she said it was a disaster of having me staying here .. During my entire stay, no one is cleaning, which is acceptable, I am fine. I had also told Eugenia I will and am willing to clean everything by myself. She told me that NO ONE enter my "private" washroom. But turned out the tenant at the basement did enter, so as Eugenia for borrowing the hair dryer... I am fine for Eugenia to come in to get the hair dryer. There is some dissolved soap on the side of sink which is very very normal as the design of her container is flat. She yelled at me saying it is VERY DIRTY. I don't know how to place a just used soap here without leaking the dissolved soap on the side of the sink. Are you supposing the tenant to go downstairs and upstairs to clean it every time after 1-2 hours of use ? By the way, I did clean myself the sink, floor and hand wash the carpet by myself throughout the stay. 2: There is a cleaning fee that Ms. Eugenia requested me to pay during my stay. But as I checked in the payment invoice, it has been paid on Oct 2017 which is for entire 92 nights stay. 3: Ms. Eugenia entered ( or broke into?) my room without my consent when I was out, which means there is no one inside the room. This happened a number of times. And only upon I use my laptop to make a video record for it, she told me about it. I asked for her before if there is a safe box inside the room. She told me no safe box here but she kept entering my room without my consent when there is no one here. Should I claim any money/items loss from her? .. I don't want to do it..
Ps. Not to mention that she came in every a few days to get items from the fridge or cupboard. Please disregard this review and if you interested in renting my property take time to read a few other ones. This renter's feedback was in any way a good reflection on my property, hospitality, house rules etc. All I have to say that Mrs. Jase, is not a reliable source and cannot be trusted. I had the worse experience with hosting her. She broke many of my house rules but the biggest one of all, is that she failed to disclose that she would be renting my place for a period of 4 months with the goal to deliver the baby (she was 8 month pregnant on the day of the arrival and in my house rules it's clearly stated no little kids, absolutely no infants) so the baby can obtain Canadian citizenship. She took advantage of the citizenship system in Canada, took advantage of my good will and human nature. She gave me a valuable lesson so next time someone bluntly lies to me, brakes the house rules - I will not hesitate to evict that person. To all future hosts, who would like to rent to Mrs. Jase; I caution you, this person can not be trusted. Please do you homework, check her legal papers, make copy of them, have a record of all the correspondence with her or just simply avoid all the trouble she might cause you and stay away from her. Also please don't hesitate to contact me directly so I can provide you with more details about this case. I will gladly spent my time to disclose all of it so the same negative situation will not happen to another host. 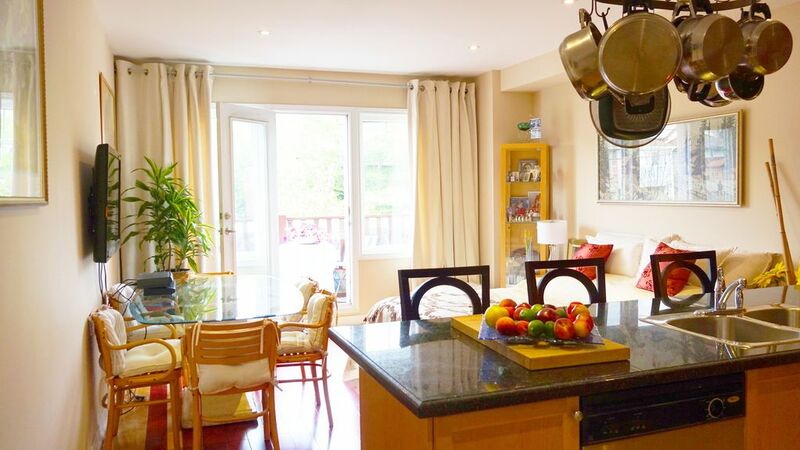 A very nice Studio Apartment with a fantastic kitchen. The front balcony lends itself to another nice exposure to the area. The beach is about 2 walking blocks away and offers a couple restaurants in addition to a nicely maintained public swimming pool. Queens Street E is 1-block from the apartment. Once you start walking east, there are so many restaurant, bars and shop choices you would need 2-weeks just to see them all. Downtown is about a 20-minute drive away. Definitely grab a boat ride, CN Tower, Second City and any one of the million bar/restaurant choices. This is a very nice apartment in a great area. Galia is a fun and very helpful property manager. Thank you Galia...Thank you Katya. Very nice location and fairly well appointed. We loved our stay in Toronto! The house was exactly what we needed, close to downtown, close to the beach. The neighborhood was wonderful .. we did lots of walking! Thank you for everything!